Flipper was the first energy auto-switching service to launch back in 2016. Since then we have seen several other companies enter the market, however each of these offer a slightly different service and none of these alternatives are truly auto-switchers in its original form – what we call flipping. To ensure we work for our members in a way that is 100% transparent and impartial, we don’t take any commission from any of the energy suppliers. 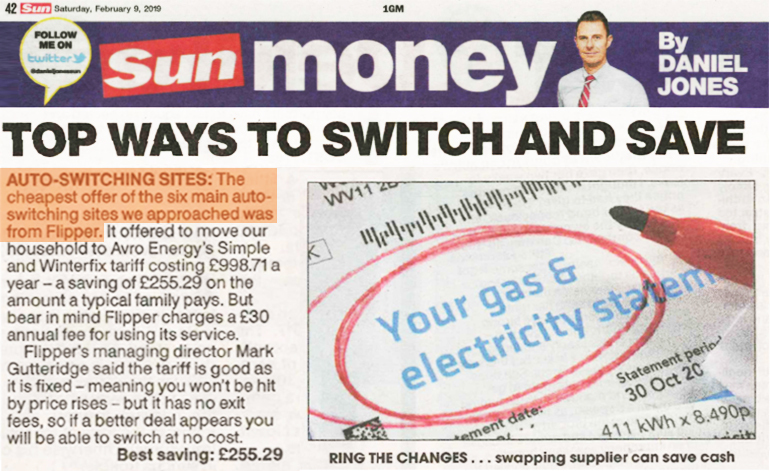 This enables us to give our members access to all the deals on the market and the ability to switch to a better deal at any point – which is something the other switching services can't do due to the commission agreements in place with the energy providers. Why use energy auto switching? As covered in our previous blog post on the energy price cap - we expected to see suppliers raise their prices after the cap limit was increased by 10.3%. Today – just 4 days after the announcement that the cap would rise - Eon were the first supplier to announce they will increase their standard tariff by £117, the maximum amount they can under the cap limit! While the other Big 6 suppliers are still to confirm their response, we are expecting them all to follow Eon and increase prices to the highest amount permitted. There were 57 price rises in 2018 and with the price cap being increased from 1st April we expect to see plenty more in 2019. However, there is talk than when the price cap is next reviewed in October it is likely to be reduced, bringing prices down. Whatever happens, Flipper will be able to find the best deal and switch you to it automatically - without you having to lift a finger. Goodbye comparing, hello flipping. The first, the best and still the only true auto-switching service - Flipper. See what you can save - Start Flipping.